Can BULLS save this V-rally, during most of 2019 so far, with a daily close above the SPX 50ma (looks easy at this time of the day) and then take it above SPX 2660 to re-establish the IT long status? I don't think so but I am always open to changing my outlook if the market tells me to do so. It has been a VERY BUSY morning trading for me with really good NQ longs and a few average NQ shorts. While yesterday's reversal was important for the bears, it really doesn't hurt the bullish view - at least not yet. After all, U.S. indices have move higher nearly uninterrupted since their December 26th low. A bit of profit taking and consolidation is never a bad thing, as long as it remains contained - and that will be the key. The Volatility Index ($VIX) held 16-17 support similar to prior bear markets, so this battle is likely just beginning. From the bulls' perspective, they want to see the rising 20 day EMA hold as support and eventually break above the recent price high and the red-dotted downtrend line shown above. For the bears, it's the opposite. They'll need to hold the line of price and trendline resistance, while counting on another bout of impulsive selling to clear that 20 day EMA support hurdle. The higher VIX is a major ally of the bears. This day is shaping up to be a revealing one insomuch as it relates to the status of the rally off the December 24 low. By the end of today, market participants should have a good idea if that rally is breaking down or simply stopped yesterday for a tuneup. We say that because there is a fundamental basis to have a good day today. Dow components IBM (IBM), Procter & Gamble(PG), and United Technologies (UTX) all exceeded consensus earnings estimates by a comfortable margin and provided relatively reassuring guidance. IBM is up 7.0% in pre-market trading; UTX is up 4.9%; and PG is 4.3%. For good measure, fellow Dow component Walmart (WMT) is up 1.2% after being upgraded to Overweight from Equal Weight at Morgan Stanley, and Comcast (CMCSA) is up 3.1% after beating earnings expectations, too. These are some widely-held stocks with some upbeat indications for their stock prices. They are the basis for why the S&P futures are up 12 points, the Dow Jones Industrial Average futures are up 173 points, and the Nasdaq 100 futures are up 32 points. Ah, but there is a bit of a headline twist. It isn't all constructive this morning. Japan reported a 3.8% year-over-year decline in exports in December, which was the largest decline reportedly since October 2016. Separately, the Bank of Japan left its key interest rate unchanged at -0.1%, lowered its FY19 inflation forecast, and acknowledged economic risks are skewed to the downside. Reuters, meanwhile, is reporting that President Trump doesn't plan to soften his position on China in order to make a trade deal, as he is pushing for structural reforms. Notably, NEC Director Kudlow said late yesterday that enforcement capabilities are a vital component of any deal the U.S. might strike with China. That contention can't be ignored by the market, as it could end up being a sticking point for China, which is unlikely to relish the thought of the U.S. having the ability to make regular checkups on China's trade actions and having the further ability to enforce penalties of some kind when it deems China is breaking the rules. The point is that the prominent trade headline today isn't a warm and fuzzy one; moreover, Japan's export decline speaks to the global growth slowdown, yet that hasn't derailed the futures market, which seems to be keying on the earnings news. That news will produce a higher start for the major indices. The question is, will the early strength be sold into or will it be sustained on the belief that yesterday's weakness was nothing more than an overdue pullback for an overbought market? The answer that unfolds is what we are driving at with the thought that today's price action will be revealing as a gauge of where this market stands at the moment. When will crude oil & SPX decouple? Correlations across assets have hit their highest level in almost a year, with the S&P 500, the 10-year U.S. Treasury yield and U.S. crude oil moving in tandem in nine of the last 12 sessions. A six-day run of declines for the asset classes earlier this month was the longest streak since June. Rolling correlations between the S&P 500 and the S&P GSCI commodities index, 10-year Treasury yield and the MSCI All Country World ex U.S. index have all stayed at or above 0.8 in recent weeks for the first time since early last year, according to a Dow Jones Market Data analysis of 50-day periods. Correlation is measured on a scale of minus-1 to 1. A reading of minus-1 means two assets are moving in opposite directions, while a correlation of 1 means they are moving in tandem. Worries over global growth resurfaced this week, pushing stocks, oil and Treasury yields lower Tuesday. The International Monetary Fund a day earlier cut its outlook for world economic growth, while official data showed China’s economy expanded at its slowest pace in nearly three decades last year. The moves have caught investors’ attention for several reasons. 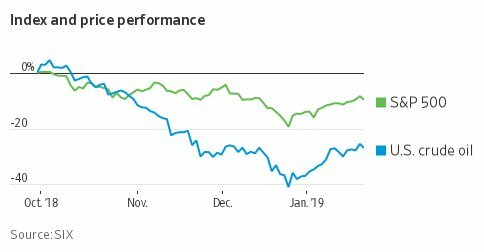 Such patterns have come near major market turning points in the past, making them an important signal to investors trying to gauge whether this year’s early rally in stocks could turn into a more sustained rebound after 2018’s steep decline. Others are worried the moves indicate that investors have loaded up on similar bets across a broad range of asset classes, setting the stage for a sudden unwind of positions once correlations break down and computer-driven trading models try to buy or sell all at once. Such a scenario unfolded in 2015 and 2016, when worries over China’s economy and recession fears triggered sharp declines across markets. While those drops were eventually followed by rallies in stocks, the whipsawing markets hurt wrongly positioned investors. Over the past three months (October 15 through January 15), analysts lowered earnings estimates for companies in the S&P 500 for the first half of 2019. The Q1 bottom-up EPS estimate (which is an aggregation of the median EPS estimates of all the companies in the index for Q1) dropped by 5.0% (to $39.37 from $41.43) during this period. The Q2 bottom-up EPS estimate (which is an aggregation of the median EPS estimates of all the companies in the index for Q2) decreased by 4.0% (to $42.36 from $44.13) during this period. Combined (adding the Q1 2018 and Q2 2018 bottom-up EPS estimates), the bottom-up EPS estimate for the first half of 2019 (1H 2019) decreased by 4.5% (to $81.73 from $85.56) over the past three months. How significant is a 4.5% decline in the bottom-up EPS estimate for the first half of a year during this period? How does this decrease compare to previous years? The marker is on the upside with Thursday’s high at 2675.47. The first level of support down is the 50-day at 2623.00, which broke but managed to claw back and retake it at the close. We are looking at 2594.40 as a new Fib retracement, which needs to hold for this rally to remain intact. to me seems we finished 4th wave 18th of Jan, now coming the 5th. I could be wrong of course. That was my best NQ SHORT trade for 2019! 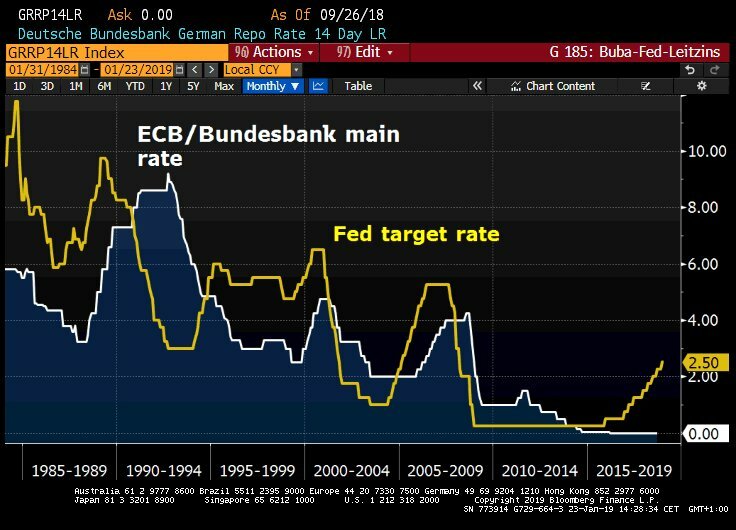 Germany's Merkel at #WEF19: Monetary policy shows effects of financial crisis lingering. Little room for manoeuvre to fight anothe downturn due to low interest rates. When the short NQ trades easier and more profitable than the long ones.... logic tells me market is bearish. Of course, nothing is cast in stone. Edited by redfoliage2, 23 January 2019 - 11:01 AM. Looking for a bounce here, but HOW HIGH?